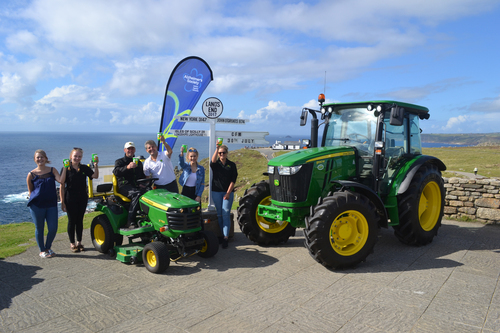 Prison officer Andy Maxfield from Inskip in Lancashire has completed his epic journey from John O’Groats to Land’s End on a John Deere lawn tractor, while raising several thousand pounds for Alzheimer’s Society. The ‘Driving the Distance for Dementia’ Challenge set off from John O’Groats at 8am on Tuesday 25th July 2017, and the Guinness world record attempt was completed when Andy and his support team arrived at Land’s End on Sunday 30th July at 4.45pm – a total measured distance of 874.3 miles travelled in five days, eight hours and 45 minutes. Andy is hoping that Guinness will verify his achievement as he drove the whole distance on his own on an unmodified lawn tractor, which has not been attempted before. “It was a fantastic team effort all round – we certainly raised awareness for Alzheimer’s Society and we all had some fun along the way,” he said. The trip included interviews with both BBC and ITV regional news and a shout-out on Radio 1’s breakfast show, while thousands of people took to social media to offer encouragement and good wishes throughout the week. “The advance planning went really well and apart from a couple of detours on the journey, nothing really went wrong apart from the weather - but even John Deere can’t control that!” said Andy. “The real star of the challenge for me though was the X750 lawn tractor. It may not be built for the road or such wet weather conditions, but it never missed a beat and the spare parts we’d taken along just in case weren’t needed. John Deere Limited’s turf division manager Chris Meacock, who organised the logistics and accompanied Andy Maxfield for a large part of the journey, said: “This really was a phenomenal achievement, given the difficulties Andy faced for much of the journey. Sue Swire, community fundraiser Cumbria & Lancashire for Alzheimer’s Society, who also travelled with the support team in Scotland, added: “The Society is so grateful for the efforts of Andy Maxfield and his family, as well as the support and generosity of John Deere and its dealers for this incredible challenge. As an additional fundraiser for Alzheimer’s Society, the charity ball will take place at Preston Masonic Hall on Saturday December 9th. There continues to be a JustGiving website page for further donations at www.justgiving.com/andrew-maxfield; donations can also be made by texting MAXF80 £3 to 70070. More information on the ball and the challenge, including photos and videos from the journey, can be found at www.facebook.com/ForgetMeNotPreston. Alzheimer’s Society is available for anyone affected by dementia and there are lots of ways the charity can help – for details call the National Dementia Helpline on 0300 222 1122 or visit www.alzheimers.org.uk.